The right managed IT services can help your business get ahead and concentrate on what matters most. That’s where Tech Rockstars comes in. We’ve been helping small businesses in Pasadena for years, streamlining their IT networks and keep their technology running without a hitch. While IT issues might be at the end of your priority list, the reality is that they have a larger impact on the success of your business than you realize. Network failures can interrupt the steady flow of work that your business needs to thrive. Your cybersecurity, or lack thereof, leaves your important data and information vulnerable to hackers and criminals. A data breach can lose you customers and money and put you on the receiving end of major lawsuits. Finally, any time your computer and IT assets are down is productivity time that you and your employees lose out on. All of these issues have a compounding effect, and then more frequently they occur, the more your business will feel it. There’s no denying that addressing all of the IT concerns and more can be a time- and labor-intensive process, but that doesn’t mean that you have to take care of it. Tech Rockstars offers a complete suite of managed IT services that handle these concerns before they become problems. With years of industry experience, we’re ready to react to the problems you’re experiencing now, as well as prevent any problems from occurring in the future. Whether you want a team of IT professionals working in the background or you need them front and center, we can help you with all of your IT needs. We offer both remote IT services, as well as on-site services. All of our IT specialists are trained and able to address your concerns and issues. We offer the services your business needs to stay up and running all day long. With 24/7 network performance monitoring, we can measure your bandwidth, look for errors, and ensure your network is running at optimal efficiency. We can manage your data with our backup and recovery solutions, keeping your data from getting damaged or lost. Thanks to our security services and comprehensive spam filters, we can keep out potentially malicious threats and attacks, keeping your business safe. In the more than 15 years we’ve been in business, Tech Rockstars has worked with countless business of all sizes. No matter what field you work in, we’re ready and able to help. However, we’re proud to specialize in a few of the industries that help to keep Pasadena running. We offer detailed solutions for accounting firms and dental clinics, as well as other fields like legal practices, and health care facilities. When you’re dealing with precious, private information, we can help you manage and secure that data. Here at Tech Rockstars, we’re committed to the success of your small business. 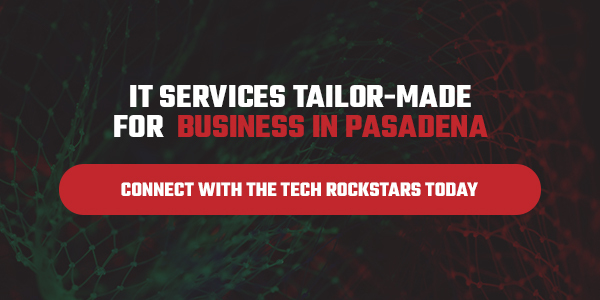 Contact us today for a free quote and consultation to see how our managed IT services in Pasadena can help your business thrive.